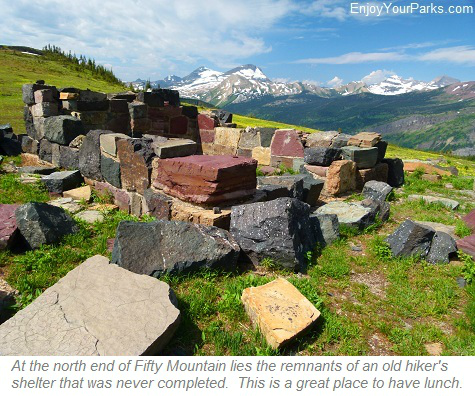 The Fifty Mountain Area along the Northern Highline Trail of Glacier Park is one of those iconic Glacier Park hikes that takes you as far away from civilization as you can get. Being about 19.5 miles north of Logan Pass and about 10.5 miles south of Goat Haunt, you can't get much "further in" than Fifty Mountain along the Northern Highline Trail in Glacier Park. 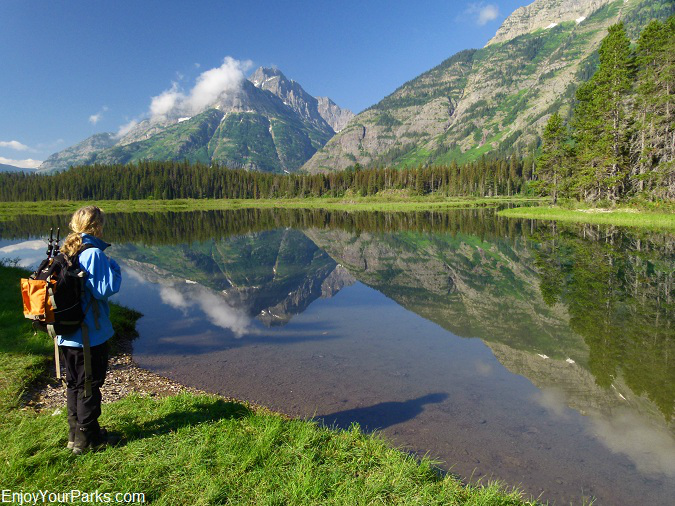 This is truly a Glacier Park hiking adventure. 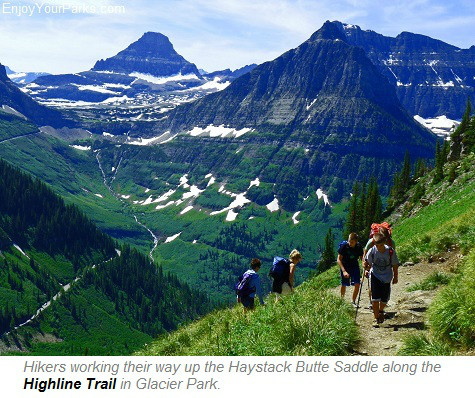 Obviously this Glacier Park hike is a multi-day backpacking excursion, and it all happens on what is known as the Northern Highline Trail. The Northern Highline Trail in Glacier Park officially runs between the Granite Park Chalet and the Fifty Mountain Backcountry Campground (11.9 miles total), but you have to add 7.6 miles along the Highline Trail to get to Granite Park Chalet and add another 10.5 along the Waterton Valley Trail from Goat Haunt. The Northern Highline Trail is basically suspended between these two other trails. Needless to say, everyone you meet at the campsite at Fifty Mountain is pretty much exhausted because there is no easy way to get there, and it's a long way from either trailhead. Well, Goat Haunt Montana is only about 10.5 miles north of Fifty Mountain, but you have to climb 2,480 vertical feet in about 3 miles with an overnight pack to get up to Fifty Mountain from there. So there really isn't an easy way to get to Fifty Mountain. 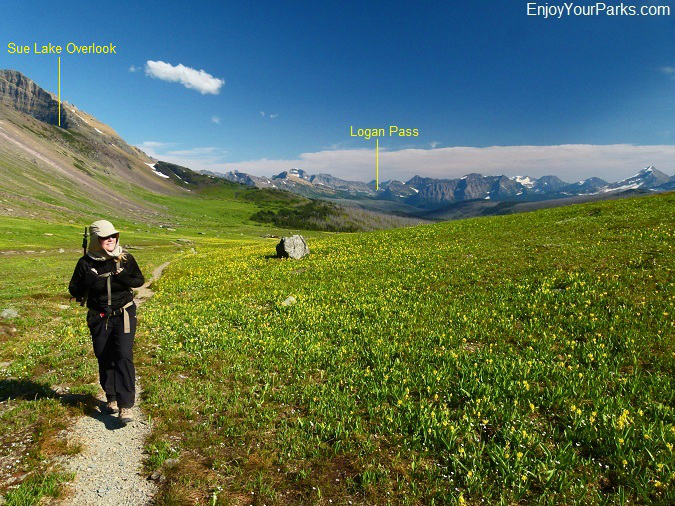 Which Trailhead: Logan Pass or Goat Haunt? Whichever direction you choose to go on this remote Glacier Park hike, whether you start at Logan Pass and end at Goat Haunt, or vice versa, you're in for a work-out. There are pros and cons to choosing either direction, but the grueling climb up and out of the Waterton Valley Trail, which is 2,480 vertical feet in about 3 miles is a real killer with an overnight pack on your back. To avoid this grueling uphill hike, Glacier Park hikers might want to consider starting at Logan Pass and come DOWN this section of the Northern Highline Trail to Goat Haunt rather than going UP this section. But no matter which way you go, and no matter how you look at it, this is definitely one of the toughest multi-day Glacier Park hikes in the entire park. 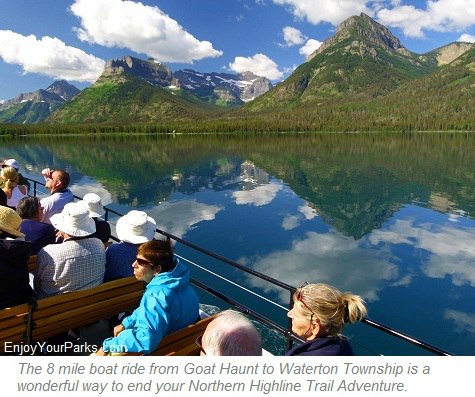 Whether you start or end at Goat Haunt, you will need a valid (and current) passport to take the Waterton Lake Tour Boat in or out of Goat Haunt Montana. Goat Haunt is a U.S.Class B Port of Entry, and you will not be allowed to pass through the Goat Haunt Ranger Station without proper documentation. There will be U.S. Customs Agents at the ranger station to make sure you have the proper documentation. If you don't have the proper documentation, you will be turned around. Seriously. Logan Pass, Glacier National Park. 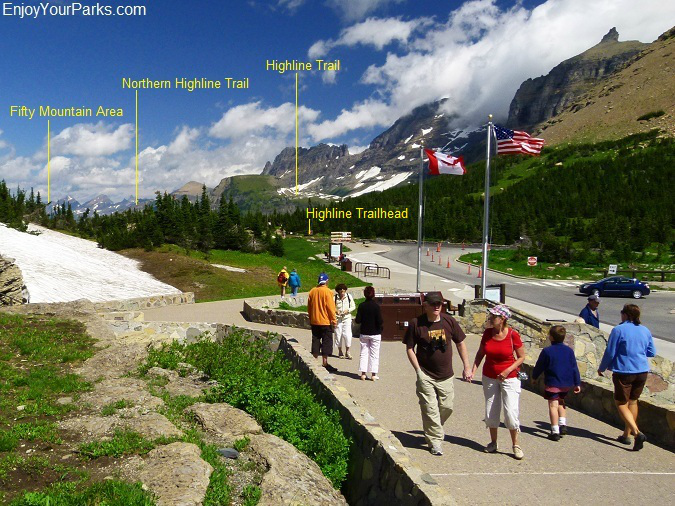 This is where your Glacier Park hiking adventure along the Northern Highline Trail begins. 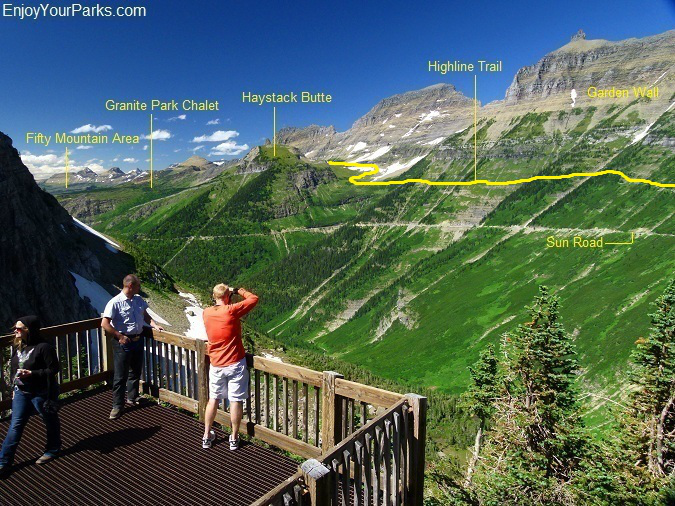 If you begin your hike along the Northern Highline Trail at Logan Pass, your Glacier Park hike starts at the trailhead for the Highline Trail which is located just north of the Logan Pass Visitor Center on the north side of the Going To The Sun Road (See photo below). The Highline Trail is a fairly easy 7.6 mile hike all the way to the Granite Park Chalet and the Granite Park Backcountry Campground, aside from the 800+ vertical gain and loss getting there. This is easier than taking the Loop Trail to Granite Park Chalet, which is about a 2,800 vertical elevation gain in less than 4 miles. Here's a view to the north from Logan Pass in Glacier Park. The Fifty Mountain Area is 19.5 miles from this spot. The trailhead to the Highline Trail is just across the Going To The Sun Road. 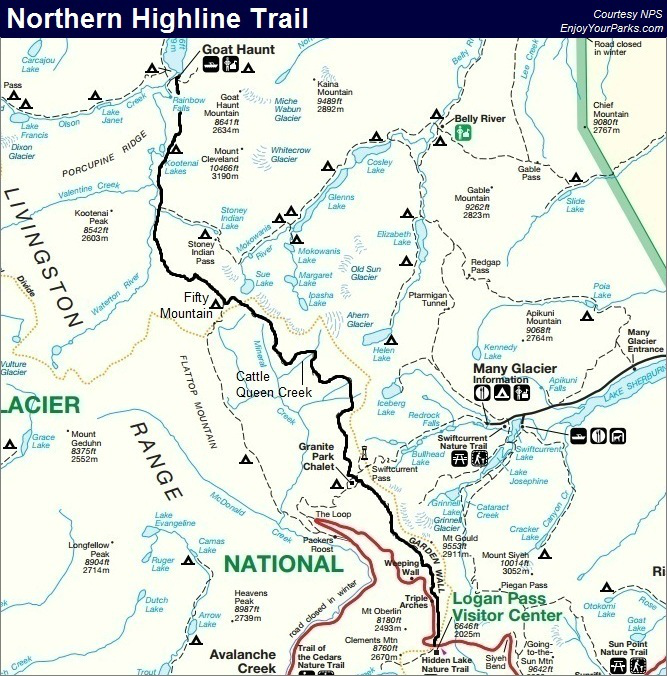 The trailhead for the Highline Trail is located just beyond the Logan Pass Visitor Center, across the Going To The Sun Road to the north (See photo above). The Highline Trail is one of the most popular Glacier Park hikes, so you definitely won't be alone, that is unless you get up really early. The Highline Trail takes you along the famed Garden Wall, providing tremendous vistas as you hike northward towards the Granite Park Chalet. At about 4 miles into this Glacier Park hike, you will encounter an abrupt elevation gain as the Highline Trail works its way through the Haystack Butte Saddle. The trail then continues to work its way along the west side of the Continental Divide another 3.6 miles until it reaches the historic Granite Park Chalet and the Granite Park Backcountry Campground. The mountain range that the Highline Trail follows all the way to Goat Haunt is called the Lewis Mountain Range, and the Continental Divide runs along this huge mountain range the entire way as well. This is a view of the Highline Trail and the Northern Lewis Range in Glacier Park from the Oberlin Bend Overlook, which is located just west of Logan Pass. The Northern Lewis Range is also where the Continental Divide is located. For the entire length of your Glacier Park hike along the Northern Highline Trail, you will hike along the west slope of the amazing Lewis Mountain Range. The mighty Livingston Range will dominate the view to the west, across a broad expanse of country that is much lower in elevation compared to these two gigantic mountain ranges that loom on each side of it. The remote Livingston Mountain Range is home to many impressive peaks and glaciers, all being seldom visited by humans. As you hike along the trail toward Fifty Mountain, the Livingston Range is constantly changing in appearance, and always dominating the view to the west. This makes for an extremely scenic and interesting hike the entire way to Fifty Mountain in Glacier Park. The historic Granite Park Chalet in Glacier Park, with massive peaks of the Livingston Range to the west. 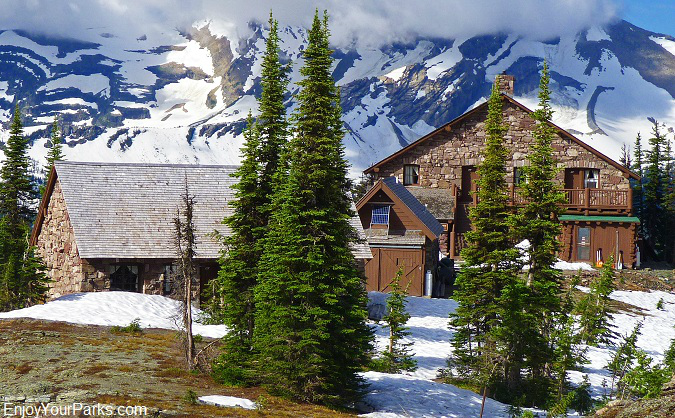 In 7.6 miles, your Glacier Park hike to Fifty Mountain will take you to the historic Granite Park Chalet. 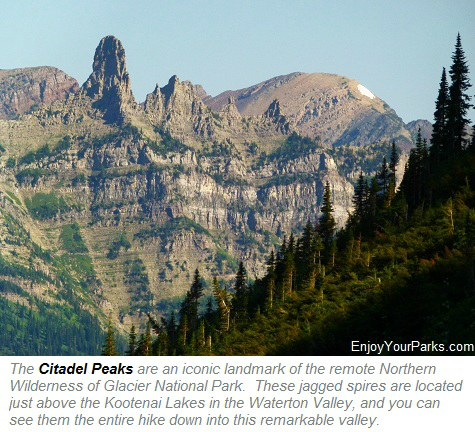 This famous icon of Glacier Park is definitely something you need to take a little time exploring before you head down the hill a few hundred vertical feet to the Granite Park Backcountry Campground. This is where you'll spend the first night of your Glacier Park hiking adventure to Fifty Mountain. The next morning, as your Glacier Park hike continues, you will encounter the Swiftcurrent Pass Trail Junction 0.2 miles north of the Granite Park Chalet. Stay left to continue hiking onward toward Fifty Mountain. In another 0.5 miles you will encounter the Granite Park Campground Trail junction. This trail is a short cut for those Glacier Park hikers coming in from Fifty Mountain. Stay right to keep hiking toward Fifty Mountain on the Northern Highline Trail. And don't forget to look back every once-in-awhile during your Glacier Park hiking adventure because the views behind you are amazing. 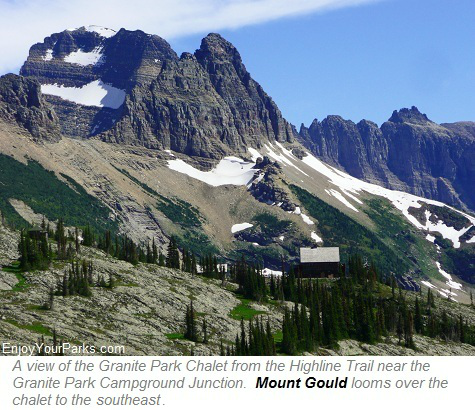 This is a view of the iconic Heavens Peak from the Northern Highline Trail in Glacier Park. 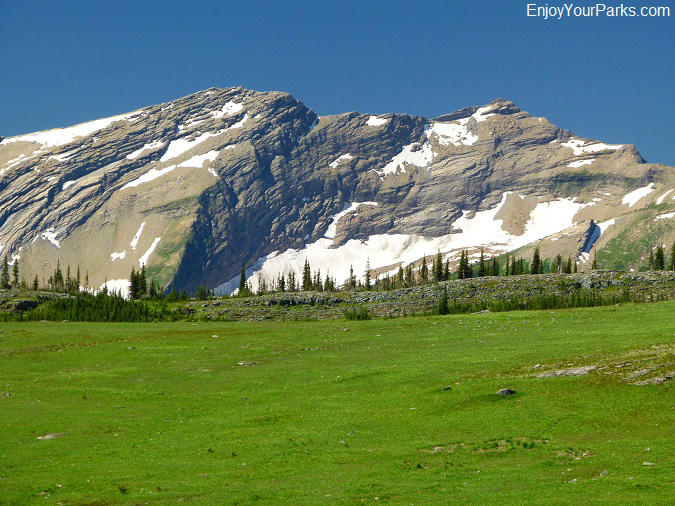 Heavens Peak is part of the remote Livingston Range, which dominates the western skyline all the way to Fifty Mountain. About a mile before you reach the Ahern Pass Trail Junction, you will encounter a sharp bend in the Northern Highline Trail the wraps around the western slope of the Continental Divide eastwardly. This creates a northern exposure on the trail with a steep mountain slope looming above it. This is the formula for an almost permanent snow field directly on the trail, which is known as the "Ahern Drift". This snow field lingers into August even on a low snow year, and often keeps the Northern Highline Trail closed. When the rangers eventually open it for hikers, there will still be a large drift that you will have to hike across. This can be quite hazardous, especially if it's early in the morning or late in the evening when the "snow" is actually pure ice. This ice is so slippery in the mornings and late afternoons that we HIGHLY recommend that you wear traction devices on your boots such as "YakTrax" or something similar while navigating this snow hazard. You should also have hiking poles to stabilize yourself. And in some cases early in the season you will need a mountain axe and be very skilled in self-arrest before attempting this snow hazard. 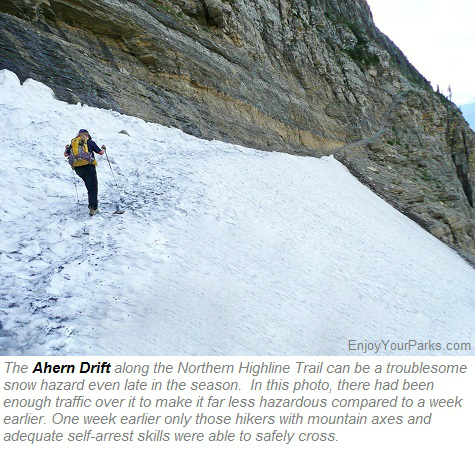 Talk to a Glacier Park Ranger at one of the ranger stations about the status of the Ahern Drift before heading out on your Glacier Park hiking adventure along the Northern Highline Trail. 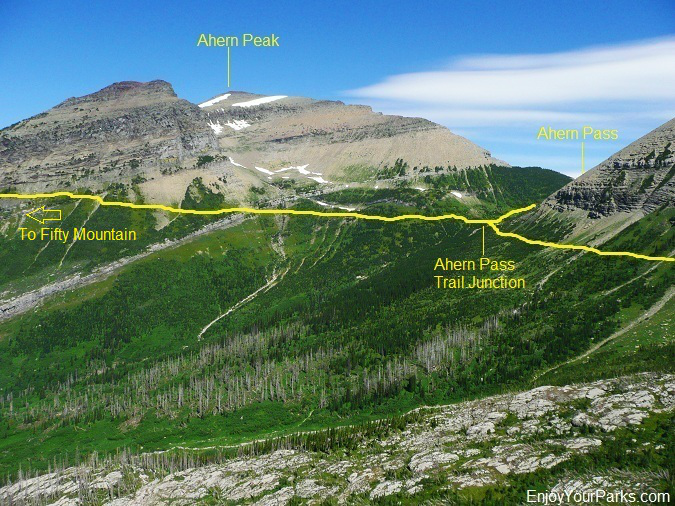 About a mile beyond the Ahern Drift along the Northern Highline Trail in Glacier Park, you will reach the Ahern Pass Trail Junction. This short 0.4 mile long trail takes you straight east to Ahern Pass, which provides a wonderful view of Helen Lake far below you, as well as a fantastic look at the iconic Pinnacle Wall. (See photo below). This short spur hike is quite easy, and if you feel you have time, we highly recommend that you check it out. This is the classic view from Ahern Pass in Glacier Park (facing east). You will see Helen Lake to the east and also Elizabeth Lake even further down what is known as the Belly River Valley. Ahern Pass is about 5 miles north of the Granite Park Chalet. The spur trail to Ahern Pass is only 0.4 miles from the Northern Highline Trail, and is well worth the effort. Ahern Pass in Glacier Park provides an incredible view of Helen Lake, Elizabeth Lake and the Ptarmigan Wall. 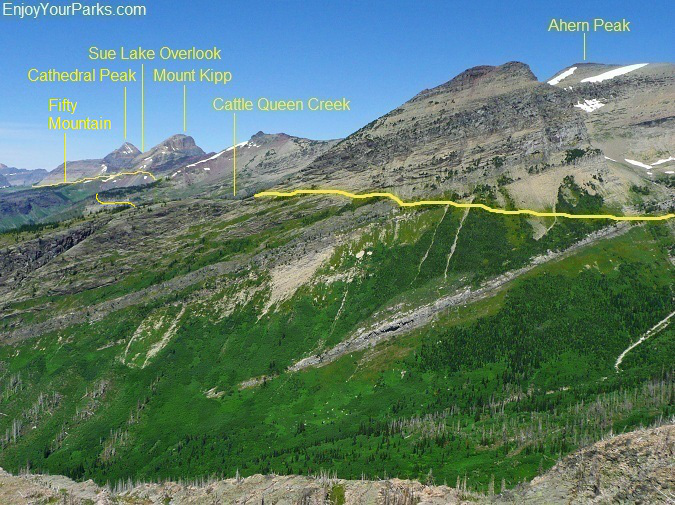 The spur trail is only 0.4 miles, and if you feel you have time, we recommend that you make Ahern Pass part of your Glacier Park hiking adventure. The views really are amazing. This is a view of the Ahern Pass Area along the Northern Highline Trail in Glacier Park. 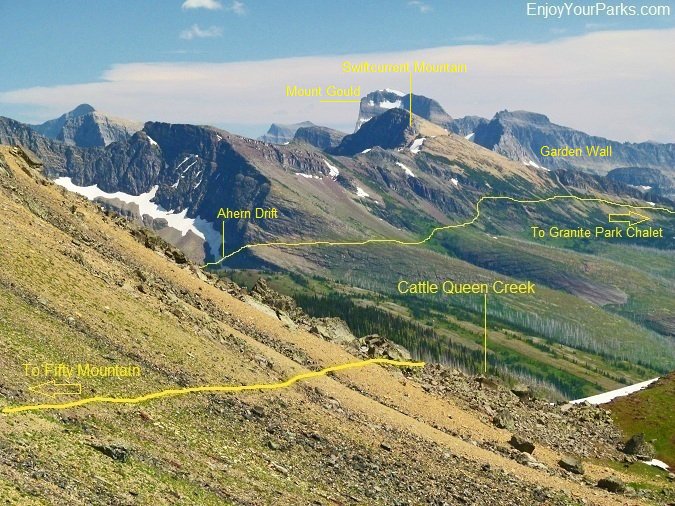 This is a view of a portion of the Northern Highline Trail as seen from Ahern Peak in Glacier Park. This is a view of Cattle Queen Creek drainage from the summit of Ahern Peak in Glacier Park (the actual creek is out of view). This is not only the lowest point of elevation on the entire Northern Highline Trail, but this drainage tends to stay filled with snow even late into the season- especially just under the north slope of Ahern Peak. 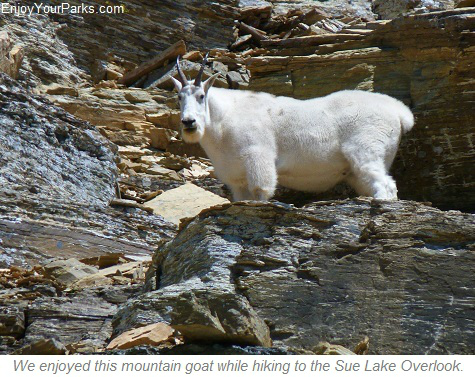 This of course can create a hazardous situation during your Glacier Park hiking adventure. The Northern Highline Trail in Glacier Park continues to work it's way along the west slope of the Continental Divide as it heads toward Fifty Mountain. Just beyond the Ahern Pass Trail Junction, the trail wraps around the west side of Ahern Peak and begins to drop about 600 feet in vertical elevation as it approaches Cattle Queen Creek. Once you reach Cattle Queen Creek, which is 2 miles north of the Ahern Pass Trail Junction, you will be standing on the lowest point of the entire Northern Highline Trail. That's not good news because as you know "what goes down must come up", and your Glacier Park hiking adventure is about to get a little more strenuous. From Cattle Queen Creek, the Northern Highline Trail begins a rather steep ascent to the north, climbing 2,000 vertical feet in about 3 miles! Just under the north slope of Ahern Peak at Cattle Queen Creek, snow tends to linger often times into August, and it can possibly present an extremely hazardous situation. Again, we recommend that you wear traction devices on your boots to cross this snow hazard, and make sure you talk with rangers before you begin your Glacier Park hike along the Northern Highline Trail. You may need a mountain axe and also the knowledge and skill to properly self-arrest if necessary. Here's a view looking back on the Northern Highline Trail in Glacier Park after the inconvenient and tiring climb out of Cattle Queen Creek. At the Sue Lake Overlook Trail Junction, you'll get your first glimpse of the Fifty Mountain Area, which is the the huge green alpine meadow in the background. About 4.4 miles north of Cattle Queen Creek you will encounter the Sue Lake Overlook Trail Junction. 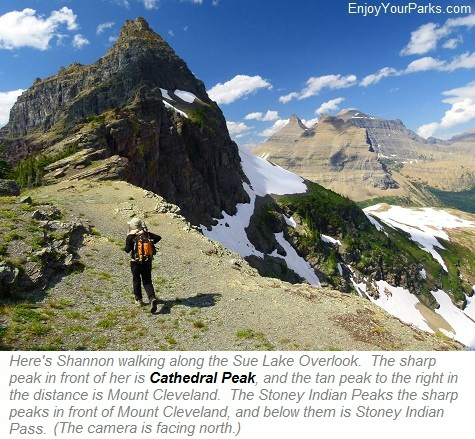 This short 0.4 mile spur trail takes Glacier Park hikers to one of the most incredible overlooks in Glacier Park. We're not kidding! The view from the Sue Lake Overlook is world class and well worth taking the time to see for yourself. At this junction you are only 1 mile from the Fifty Mountain Backcountry Campground. The Sue Lake Overlook (elevation 7,700 feet) along the Northern Highline Trail in Glacier Park provides magnificent views in all directions. This is a view to the east, with Sue Lake thousands of feet below you. The Sue Lake Overlook (elevation 7,700 feet) provides world class views, and in our opinion is the most scenic spot on the entire Northern Highline Trail. You will be standing thousands of feet above the pristine Sue Lake to the east. Cathedral Peak rises above you to the north (left) and Mount Kipp towers over you to the south (right). Straight ahead of you beyond Sue Lake is Pyramid Peak, and beyond Pyramid Peak is the Cosley Lake - Glenns Lake - Mokowanis Lake complex, with Mount Merritt dominating the skyline. You will also get a great view of Mount Cleveland and the Stoney Indian Pass area. When looking westward from the Sue Lake Overlook, the Livingston Range really shows itself off. 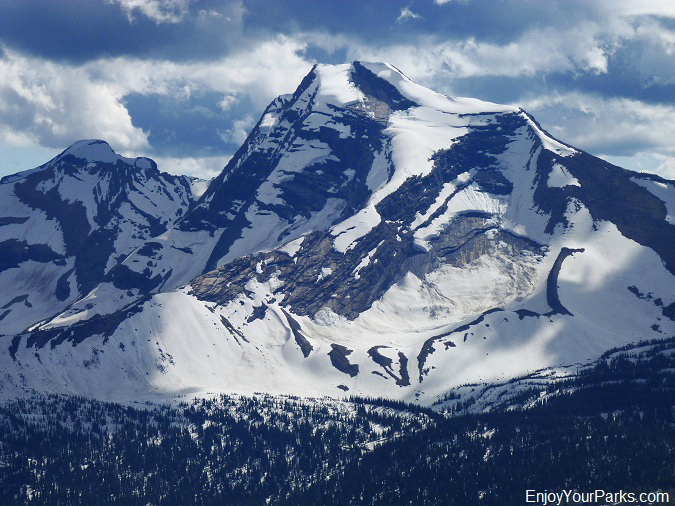 Jagged peaks and numerous glaciers and snow fields dominate the western skyline. And below you to the west, resting on a huge alpine shelf, is the Fifty Mountain Backcountry Campground. What we recommend is to keep going to Fifty Mountain and get your camp set up and eat a good meal. Once you've rested, then hike back up to the Sue Lake Overlook Trail Junction (1 mile), and take this short 0.4 mile hike to the overlook. Another option is to get up early the next morning and run up to the overlook before you pack up and begin heading down to Kootenai Lakes. 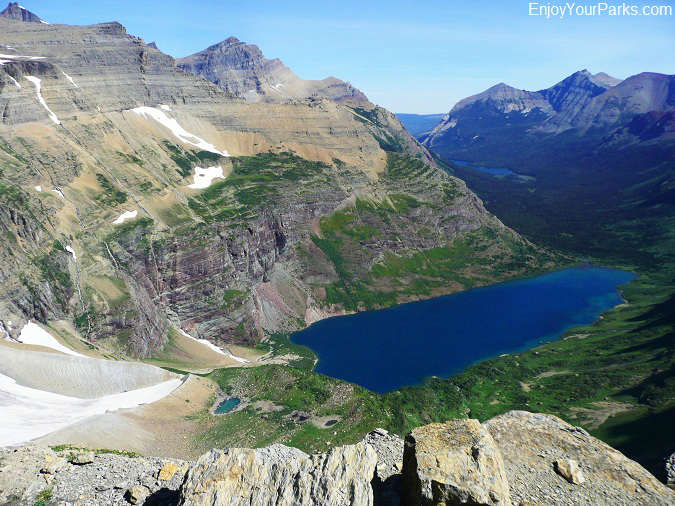 However you do it, you'll be thrilled you took the time and effort to stand on the Sue Lake Overlook in Glacier Park. Without question it's the most scenic spot on the entire Northern Highline Trail. Glacier Lilies galore! 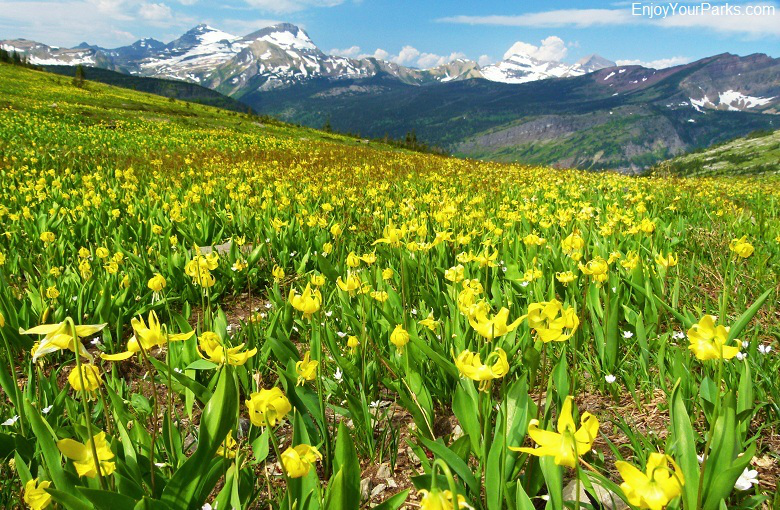 At Fifty Mountain in Glacier Park, right when the snow melts off this huge alpine meadow, Glacier Lilies literally blanket the entire area. It's one of the most incredible things we've ever seen. Only 1 mile from the Sue Lake Overlook Trail Junction is the Fifty Mountain Backcountry Campground. The trail drops about 750 feet in elevation during this mile, and the view of the Fifty Mountain Area all the way down to the campground is spectacular, especially of the Livingston Range to the west, and of the amazing Fifty Mountain area below. Fifty Mountain is basically a huge alpine shelf that rests along the west side of the Continental Divide. 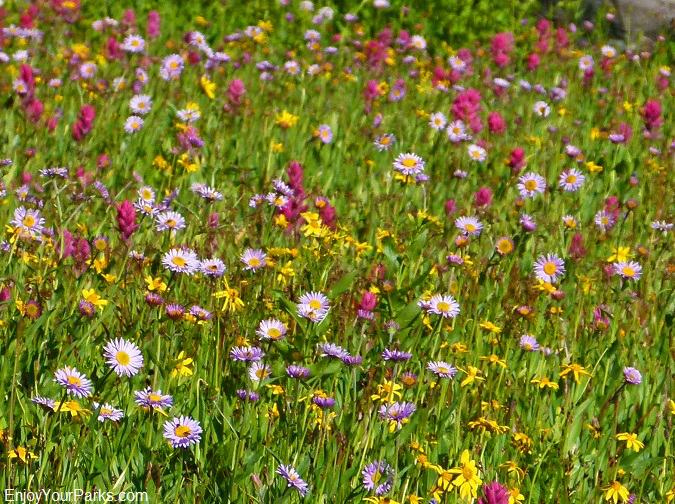 This amazing alpine meadow is literally covered in wildflowers during certain times of the summer. We've hiked up to Fifty Mountain several times just after the snow melts, and all we could see for miles was bright yellow Glacier Lilies! It's truly a magnificent sight that makes you want to sing "The Sound of Music". The Fifty Mountain Area is one of the most scenic backcountry meadows on earth, and is truly a just reward for your hard work getting there. 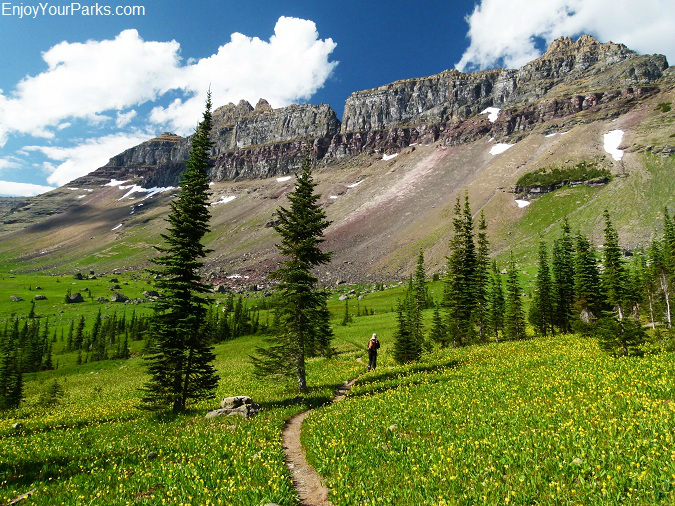 This is definitely one of the most special hikes in Glacier Park. The wildflowers at Fifty Mountain in Glacier Park are absolutely stunning! Far to the west, beyond what's known as Flattop Mountain, is the incredible Livingston Range- which is the same mountain range that you've enjoyed all the way up from Logan Pass. To the south you can actually see the Logan Pass Area, with Clements Mountain and Cannon Mountain showing their northern slopes. To the east is the dramatic western slope of the Lewis Range, which is also the west slope of the Continental Divide. Mount Kipp and Cathedral Kip dominate the skyline directly east of the campground, which the Sue Lake Overlook nestled in between these huge mountains. 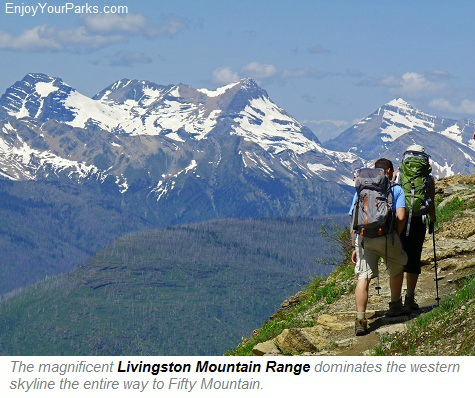 The Livingston Range acts as a perfect backdrop for the Fifty Mountain Area in Glacier Park. 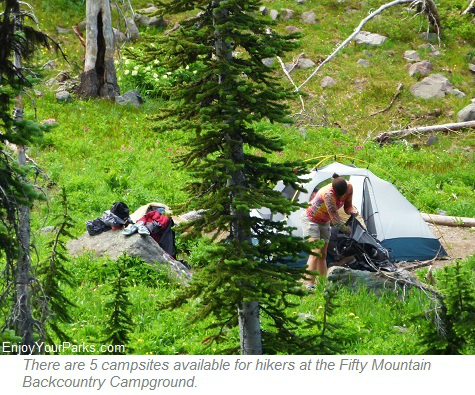 Fifty Mountain Backcountry Campground is nestled along the tree line. Notice the towering mountains of the Livingston Range in the distance. The Fifty Mountain Area in Glacier Park is a very special place. The Fifty Mountain Backcountry Campground in Glacier Park has 5 campsites, and is nestled next to what was a subalpine fir forest. These trees burned during the Flattop Mountain Fire of 1998. But the scenery is so incredible and the meadow is so vast that the fire did not destroy the overall beauty of this area. This remote campground also has a pit toilet, food preparation area and a place to hang your food. 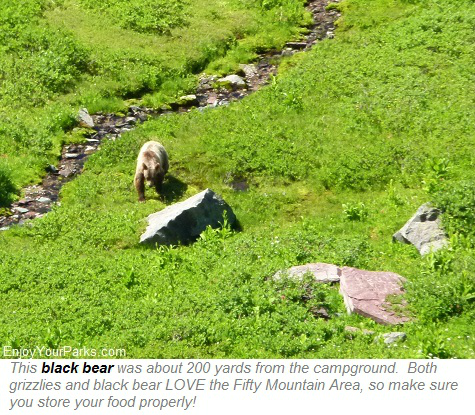 Make sure you are extremely careful about hanging your food because grizzly bears and black bears really like the Fifty Mountain Area. Nearly everytime we've been up there we've seen bears. You'll see a trail junction at the Fifty Mountain Backcountry Campground where the Flattop Mountain Trail heads west of the Northern Highline Trail. This trail takes you over Kootenai Pass and then southward across the broad, flat topped mountain of Flattop Mountain and then onto what's known as Packer's Roost. From there the trail climbs back up to the Loop Trail several thousand feet below the Granite Park Chalet. Most of this trail takes you through the remnants of the Flattop Mountain Fire of 1998, and is not especially scenic. The Flattop Mountain Trail essentially parallels the Northern Highline Trail, so the only reason a Glacier Park hiker would take the Flattop Mountain Trail is if the snow hazards have the Northern Highline Trail closed. However, if the Northern Highline Trail is closed, then more than likely Fifty Mountain Campground is closed, so talk to a Glacier Park ranger at one of the Glacier Park ranger stations to learn the status of the trails heading to Fifty Mountain. 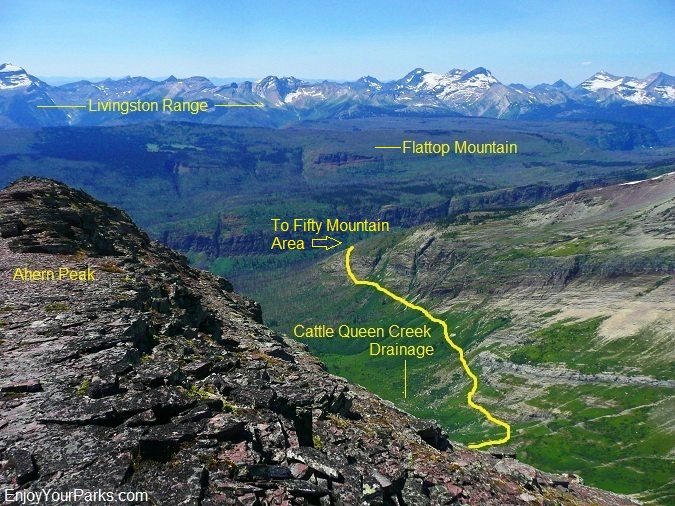 The Flattop Mountain Trail Junction at the Fifty Mountain Campground marks where the Northern Highline Trail officially ends and the Waterton Valley Trail officiall begins. 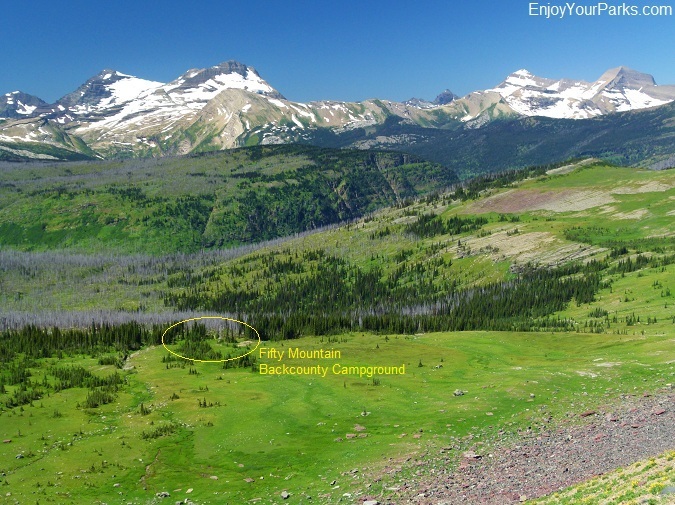 The Fifty Mountain Meadow in Glacier Park is one of the most incredible alpine meadows in the country, and the view is spectular in all directions... you can even see Logan Pass, which is 19.5 miles to the south. All of your effort during your Glacier Park hiking adventure really begins to pay off in this beautiful place. 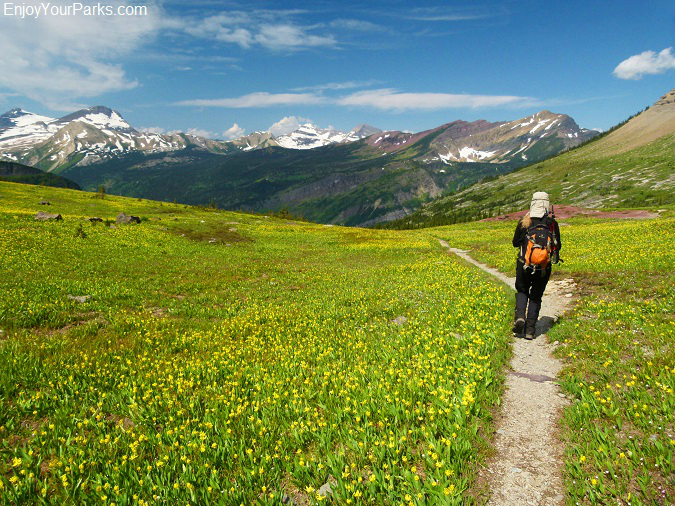 The section of the trail that lies in the two mile stretch between the Fifty Mountain Backcountry Campground and the northern end of the Fifty Mountain Meadow is one of the prettiest Glacier Park hikes anywhere in the park. The Fifty Mountain Meadow along the Northern Highline Trail in Glacier Park makes you want to sing "The Sound of Music".... We're not kidding! This huge alpine meadow at times is completely covered in wildflowers- literally. 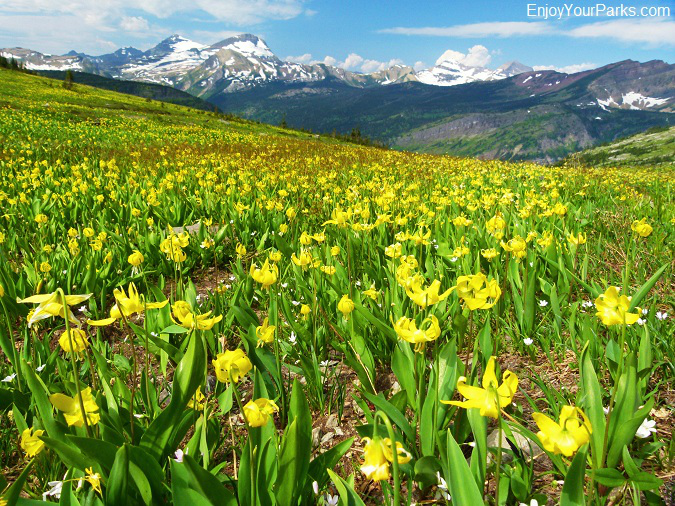 If fact, whenever we are at Fifty Mountain just after the snow melts, bright yellow Glacier Lilies completely blanket the entire Fifty Mountain Area. It's one of the most amazing sights we've ever seen. We call the Fifty Mountain Meadow "The Sound of Music Meadow", and once you visit this special place during your Glacier Park hiking adventure along the Northern Highline Trail, you'll understand why we call it that. 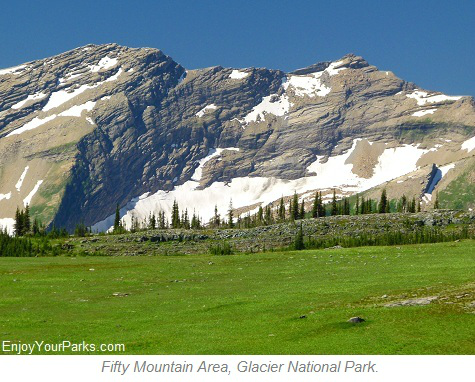 This 2 mile long alpine meadow is one of Glacier Park's secret gems. At the far northern end of this "Sound of Music" meadow, you'll see the remnants of an old stone shelter that was never completed. The view from this old stone shelter is an absolutely astounding view in all directions. You can see Logan Pass 21.5 miles to the south, the entire Livingston Range completely dominating the western skyline all the way from north to south, and the towering Lewis Range with Cathedral Peak and Mount Kipp to the east. This old shelter is a popular place for enjoying a nice lunch for those Glacier Park hikers coming up from Goat Haunt and Kootenai Lakes. 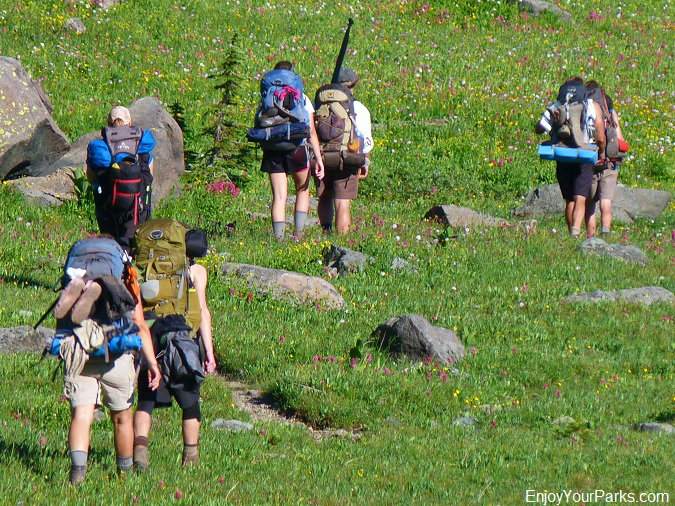 Hikers heading for the Fifty Mountain Backcounty Campground in Glacier Park. They came from Goat Haunt Montana and hiked up the grueling 2,480 foot climb (in 3 miles) out of the Waterton Valley. 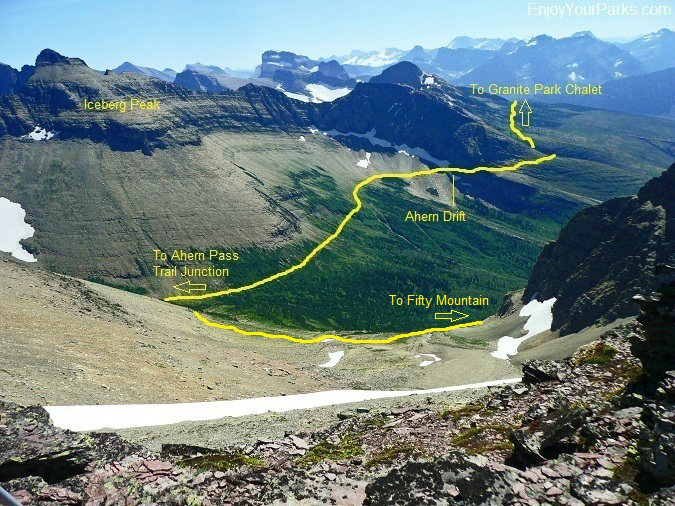 Once you leave the Fifty Mountain Meadow, the trail will then take you down 2,480 vertical feet into the Waterton Valley on your way to Kootenai Lakes and Goat Haunt in Glacier National Park. Once you've enjoyed a night at Fifty Mountain, which is one of Glacier Park's most remote backcountry campground, AND once you've hiked to the Sue Lake Overlook, it's time to keep hiking toward your final destination... which is Goat Haunt Montana located near the northern border of Glacier Park via the Kootenai Lakes. After dropping about 2,480 vertical feet, you'll end up in the bottom of the Waterton Valley. From there the Waterton Valley Trail will take you to Kootenai Lakes, which where the next backcountry campground is located. Notice the sharp spires of the Citadel Peaks that are directly above Kootenai Lakes. Once the Waterton Valley Trail in Glacier Park leaves the beautiful alpine meadow of Fifty Mountain, it winds down a forested valley and ends up working its way down a heavily vegetated western slope that drops about 2,480 vertical feet in about 3 miles into the great Waterton Valley. The views from this open slope are quite remarkable, as you can see the iconic Citadel Peaks far to the north, which tower directly above your next destination.... which is Kootenai Lakes. Once the trail reaches the bottom of the Waterton Valley, it levels out as you begin to head straight north towards Kootenai Lakes and Goat Haunt in Glacier Park. Reaching the valley floor is definitely welcome so you can again begin to hike on fairly level ground. Once your Glacier Park hiking adventure takes you to nearly the bottom of the Waterton Valley, you'll both see and hear the roar of the Waterton River below you to the west (left). In about another mile as the trail continues straight north you will reach the Stoney Indian Pass Trail Junction. From here you are only 2.1 miles from Kootenai Lakes Backcountry Campground. Kootenai Lakes is a gorgeous area with an abundant population of moose. Often times you'll see moose feeding in the lakes. The Kootenai Lake Campground is located right along the shore of the lake shown in this photo... not a bad setting for a campground wouldn't you say? As the Waterton Valley Trail takes you down the middle of the great Waterton Valley during your Glacier Park hiking adventure, in only about 2.1 miles you will reach the Kootenai Lake Trail Junction which is a short 0.3 mile spur trail that takes you to the shore of the largest of the Kootenai Lakes (known simply as Kootenai Lake) and the Kootenai Lake Backcountry Campground. The Kootenai Lakes Area is extremely scenic and home to an abundant population of moose. You can't help but notice the sharp spires of Citadel Peaks that tower above Kootenai Lake to the west, and if you look carefully you just might see a moose hanging out along the shore of the lake, or even in the lake feeding on the vegetation living on the lake floor. For all the details on the Kootenai Lakes Area, click here. Goat Haunt Montana lies at the head of Upper Waterton Lake, and is the Gateway to the Northern Wilderness of Glacier National Park. 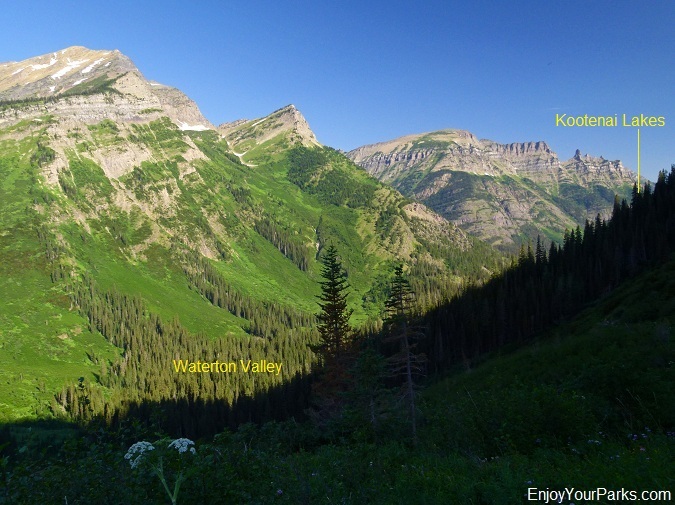 Once you've enjoyed a night at the Kootenai Lake Backcountry Campground (If you choose to do so), once you hike back 0.3 miles to the Kootenai Lake Trail Junction, the Waterton Valley Trail takes you another 2.5 miles to Goat Haunt Montana. 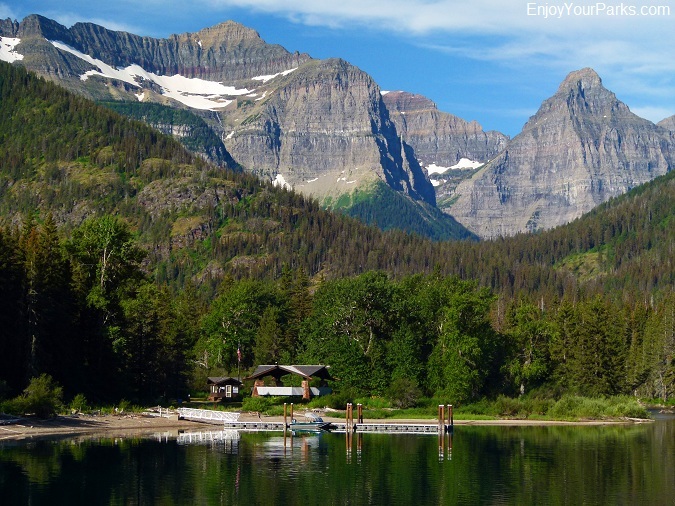 This is where your Glacier Park hiking adventure comes to an end. At Goat Haunt, which is located on the southern-most point of Upper Waterton Lake, you will be stopped at the Goat Haunt Ranger Station by U.S. Customs Agents, and will be asked to show your valid passport. Only U.S Citizens and Canadian Citizens (with proper documentation) can pass through this Port of Entry, so please take note of this as you are making plans for your Northern Highline Trail hike. If you don't have a valid passport, you will not be able to cross, and you will have to hike all the way back to where you started from at Logan Pass, which is now 30 miles to the south of you. We're not kidding. 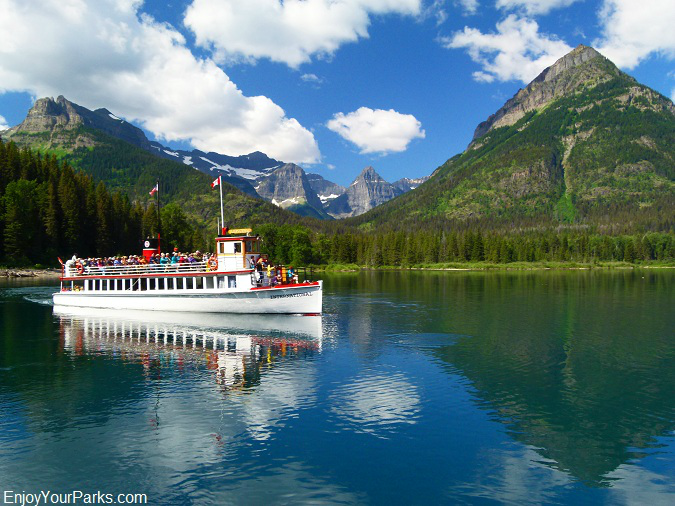 The historic boat "International" will take you on an 8 mile long boat ride to Waterton Township, which officially marks the end of your Glacier Park hiking adventure in the Northern Wilderness of Glacier National Park. Once you get through Customs, you can then catch a ride with one of the Waterton Lake Tour Boats. These boats take Glacier Park hikers (who came from the northern wilderness of Glacier Park) to Waterton Township, 8 miles down the Upper Waterton Lake. About 4 miles into your boat ride you will cross the U.S. Canadian Border into Canada, and you are now in Waterton Lakes National Park. To purchase a ticket, you'll have to wait until one of the Waterton Lake Tour Boats docks at Goat Haunt. These boats make several runs a day, and usually there are available seats. During certain Canadian Holidays however, getting a seat (and a ticket) might be quite difficult. Waterton Township rests on the far northern shore of the massive Upper Waterton Lake (usually just called Waterton Lake). From Waterton Township hopefully you have an East Side Glacier Park Shuttle scheduled to take you back to your vehicle at St. Mary or Logan Pass. 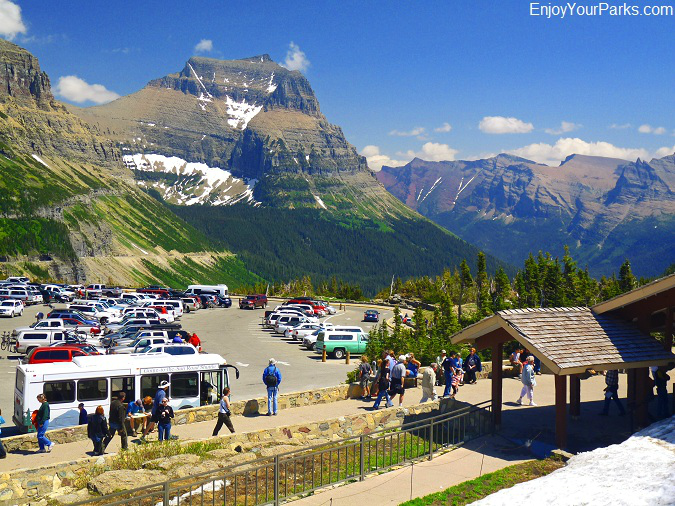 (The East Side Shuttle does not enter Glacier National Park, so if your vehicle is parked at Logan Pass, the East Side Shuttle will drop you off at St. Mary, and you'll have to catch a National Park Shuttle to Logan Pass. For all the details on Goat Haunt, click here. 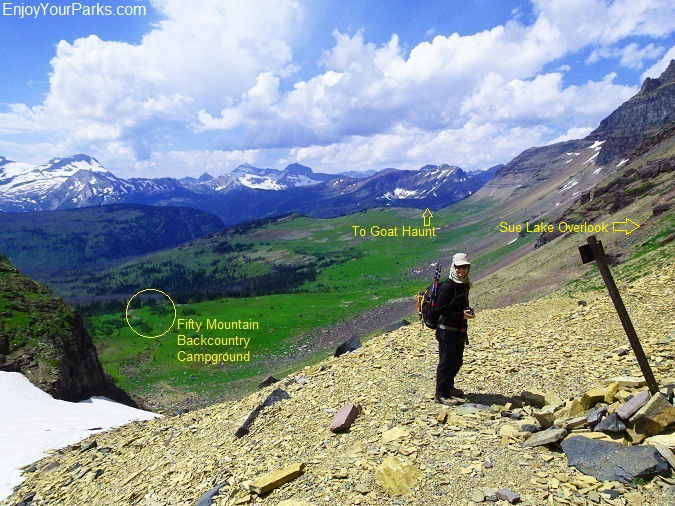 The hike along the Northern Highline Trail from Logan Pass to Goat Haunt (or vice versa) is obviously for experienced overnight backpackers only due to the distance involved and the elevation gain and loss, as well as the potential snow hazards that may be present. 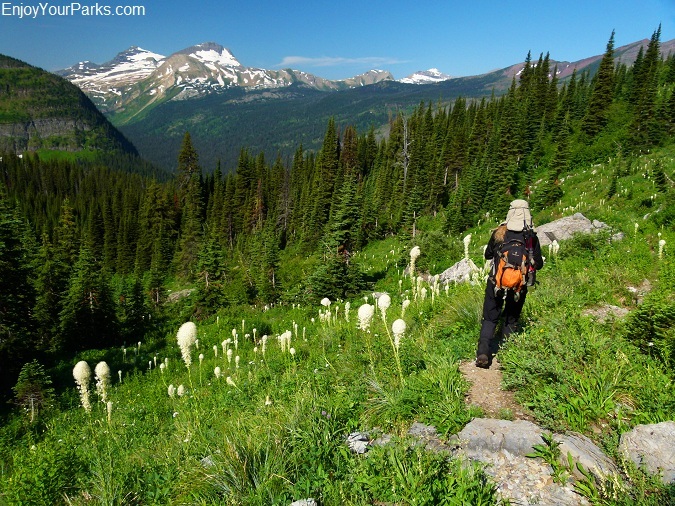 This is one of the most physically demanding of the overnight Glacier Park hikes, but is extremely rewarding as you enter very remote northern country that is seldom seen by humans. 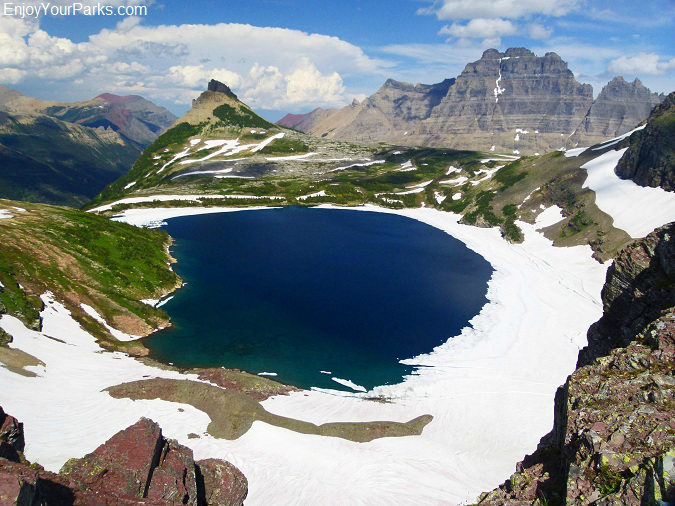 This will truly be one of those Glacier Park hiking adventures that you will not only enjoy but you will never forget.